A range of WRAS approved nickel plated, stamped brass manifolds in ¾” and 1” inlet sizes. Available in 2, 3 and 4 ways per manifold with an extension coupling for greater than 4 way applications. Wheelhead isolation valves at a 45o angle for ease of use with red and blue labels supplied for easy identification of each circuit. Multiplex manifolds can be mounted using our slider rail system, or the ‘Termobox’ plastic manifold cabinet. Also available are a range of accessories including ball valves, mounting brackets, fittings and WRAS approved Monoblocco pipe connectors for a wide range of pipe types and sizes. Why should I use TopSan manifolds, instead of the Multiplex manifold? 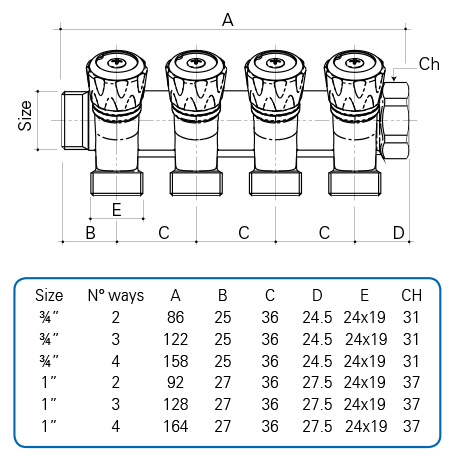 The TopSan was developed to allow more than 4-ways to be used without having to spend time on screwing together more than one manifold – for example if you are supplying two bathrooms from one set of manifolds, needing an 7-way for the cold supply (2 toilets, 2 basins, 2 showers and 1 bath) and a 5-way for hot (no toilets). Using Multiplex you would need a 4-way + a 3-way, and for the hot supply you would need a 3-way plus a 2-way – 2 more connections than you would have with a TopSan set of manifolds. Can I use 10mm pipe for sanitary supply? This is simply a question of the available flow, pressure and pipe run length. 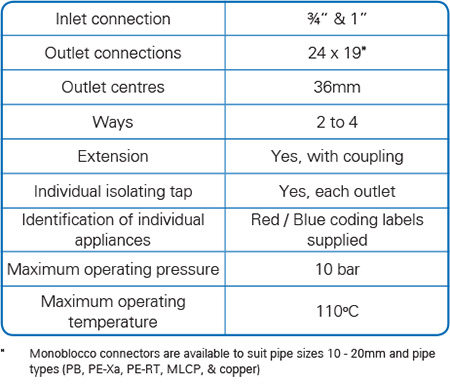 It is now common practice to supply basin taps for example, with 10mm PB pipe over a reasonable distance of some meters. Do I need to terminate at the manifold? No, you do not – simply continue through the manifold. Connect your flow in at one end and connect your flow out at the other end, instead of blanking the manifold off. Then continue your pipe run onto the final destination. Make sure overall you have enough flow to provide to more than one set of hot and cold manifolds. How do I connect 22mm pipe? Our manifolds have a maximum internal diameter of 20mm, with an external diameter of 24mm. You cannot connect 22mm pipe to the outlets, but using a standard 1” or ¾” Male or Female BSP by 22mm compression adaptor, you can connect up 22mm copper or PB pipe to the inlet side. We have found over the seven years of using these manifold in UK new houses that you don’t need more then 15mm pipe for main unvented hot water cylinder supply.